If you are trying to drop those unwanted pounds, you might want to know the list of the kitchen gadgets to lose weight. Maybe it sounds funny, but the right kitchen gadgets can actually make it easier to stick to your diet, cut calories and drop pounds. Here are seven kitchen gadgets you should have in order to lose weight. When you are trying to lose weight, measuring spoons are a must. 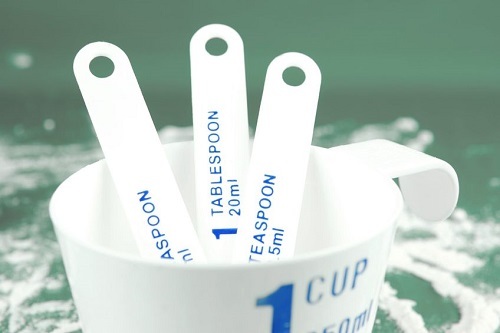 You might not use these spoons every day, but still they are extremely useful. For instance, measuring spoons are useful when you’re measuring out condiments like salad dressing or butter. Develop the habit of using measuring spoons daily and you won’t regret it. Another kitchen gadget that can help you lose weight is measuring cups. They are my best friend and they’ve already helped me drop a few extra pounds. Many people usually overestimate what a real serving size is and having measuring cups in your kitchen will help you get the right serving size and cut unwanted calories. A muffin pan is a must-have kitchen gadget, especially if you are trying to stick to a healthy diet. There are a few different ways to use a muffin pan. It really helps to have the right portion size. Plus, you can make mini meatloaves and many other healthy recipes in a muffin pan. I like to use a muffin pan to bake cupcakes, because I think one cupcake is better for my weight than a piece of cake. It can be difficult to avoid overeating when you use large plates. Small plates are a kitchen gadget that will help you avoid overeating and therefore cut unwanted calories. The great news is that serving your food on a smaller plate will help you eat less and you won’t even notice it. I’ve tried this tip and I recommend you to try it too. Perhaps you are surprised to see aluminum foil on the list of the essential kitchen gadgets that can help you lose weight. But when you are trying to drop a few pounds, aluminum foil can actually come in handy. It will help you start cooking more baked foods and stop making fried foods. Plus, aluminum foil can be used for single-serving packets for meals. This amazing kitchen gadget can do wonders. You won’t know if you have the right measurement, if you don’t weigh it. Scales are a must have tool for those who often cook at home and who want to keep their weight under control. They help to know the right amount of food you eat and can aid weight loss. I know it sounds obvious but we often forget about ziplock bags. Ziplock bags work incredibly to premeasure healthy snacks. This means, you will only eat one serving size and you won’t overeat. Ziplock bags can be useful for healthy on-the-go snacks too. Instead of taking something delicious from a vending machine, reach for a diet-friendly snack from your purse and cut unwanted calories. There are many kitchen gadgets that help to lose weight, but these are the most useful ones. What kitchen gadgets do you use to lose weight? Share your thoughts and tips please.